This is essentially, a best of Emery Gulash, early diesels program. Drawn from over 30 hours of train film, it has an outstanding well, from which to draw. Emery used high quality 16 mm film. He also filmed in color. A great cinematographer. Emery’s films are among the top of the best train films from the classic era. 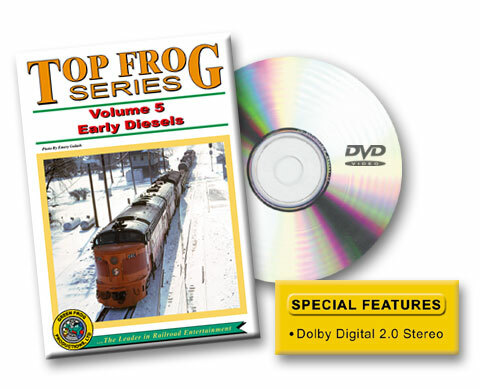 Green Frog has done excellent work, with high quality presentations of this film source. Emery + Green Frog = Quality! A Santa Fe Alco PA kick-off of this video, in the classic warbonnet scheme in 1958. A black and silver RSD5 is shown. EMD FT in ATSF colors are next. A warbonnet E8, is shown with a review screen that offers: model, horsepower, cylinders. This data is shown on many of these early diesels. The action moves to Chicago with the Super Chief. Alco RSD15 trio appears out west. The station at Amarillo hosts the all-time classic EMD F7, it’s shown in a large lash-up in the Santa Fe freight scheme. Amarillo has more action: F7, Alco PA, GP30’s. The action continues in this fast-moving program. They pause long enough to briefly discuss the featured locomotive. Santa Fe provides a wide assortment of 1st and 2nd generation locomotives. Alco, EMD, Baldwin and GE types make a fine sequence. Much later, we’ll see a rare Santa Fe Fairbanks Morse switcher model H-12-44, with a local, at Willow Springs. The show moves onward to many other roads. Union Pacific, Milwaukee Road, New York Central, Gulf, Mobile & Ohio, B&O, Rock Island, Nickel Plate, Soo Line, Erie Lackawanna, and Pennsylvania are all included in this fine program. Normal freight and passenger trains frame the story. These vignettes are like a preview show. The assorted railroads and many rare locos in one place, do make for a handy reference. There are even trains not listed. Can you say Wabash? Also, CB&Q GE u25B and an EMD SD24, aka Burlington Route are featured. A Grand Trunk F3A has that models data. The quality is consistently high, as seen in the other Green Frog/ Emery Gulash films. A newcomer would do fine starting with this DVD. It will satisfy any railfan, though longtime collectors will already have most or all of this material. This entry was posted in ATVR Reviews, Green Frog Prod. and tagged American Train Video Reviews, B&O, Burlington Route, Chicago railroad, Emery Gulash, Erie Lackawanna, Milwaukee Road, New York Central, Pennsylvania, Railroad, Rio Grande, Rock Island, Santa Fe, Train DVD, Union Pacific by William J. Hudson. Bookmark the permalink.